Welcome to the online home of Happy Day Music! July, 2018 Announcement: Tammis will be retiring from leading Happy Day Music classes in childcare centers as of August 1st. I want to thank all the parents who have supported this program over the years. It has been my complete joy to work with the children and I will miss them very much! Please let me know via the Contact page (or call/text me) if you would like to be informed about library music time, musical birthday parties, or other classes I may offer on weekends. 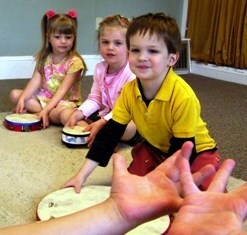 Happy Day Music creates energy-filled music environments, where the joy of making music with teachers, friends and parents is a highlight of every child’s day. Click "Contact Us" if you would like to be put on the mailing list. 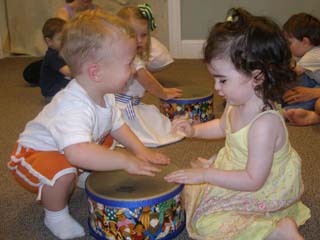 "Children must receive music instruction as naturally as food, with as much pleasure as they derive from a ball game, and this must happen from the beginning of their lives." "Tammis's class is the highlight of our week! Thanks for all your generous teaching"
"This is an outstanding class!" "...you were so magical with the kids and they really loved you. It was a very positive experience..."
"An excellent experience! Very positive and fun. We look forward to the next class!" "A very hands-on, enjoyable atmosphere..."